If you’ve read many of my past posts on this site or heard me give one of my presentations, you probably know that I think my mother is an amazing gardener. I’m always telling her she’s one of the best designers I’ve met (which she never really believes). My parents live in Meadow Vista, CA (USDA zone 9a). They regularly experience temps in the low teens (including a bit of snowfall each winter) followed by blistering hot temperatures in the summer. On top of that, there’s a giant volcano top lying just under the surface of their entire 1 1/2-acre garden, making digging holes an inconvenience most of us could never image. Think tractors with strong engines just to plant a small tree. Or, one broken shovel tip after another when hitting a surprise lava layer hiding just under the surface of perfectly amended soil. You can’t have a beautiful garden in this area without having extraordinary determination with no fear of hard labor and a strong back. Luckily my mother has all of these. Over the years, I’ve used photos of her garden in both of my books, in many articles and here on my blog. One of my friends, Pam Penick of Digging, recently sent me a note asking if I’ve ever written anything specifically about her garden as she’d like to see more of it. And when I thought about it, I realized I never had! So I thought I’d write about my mother’s garden over the next year and how it looks through the different seasons – starting with the fall. Last month I spent Thanksgiving with my parents and couldn’t believe how good her garden looked despite having already gone through a few early frosts preceded by one of the worst droughts California has seen in decades. As I walked around her garden, it dawned on me that while my mother is certainly talented with combining stunning flowers in her garden beds (as you can see in the above photos), she is equally skilled with her creative use of foliage. 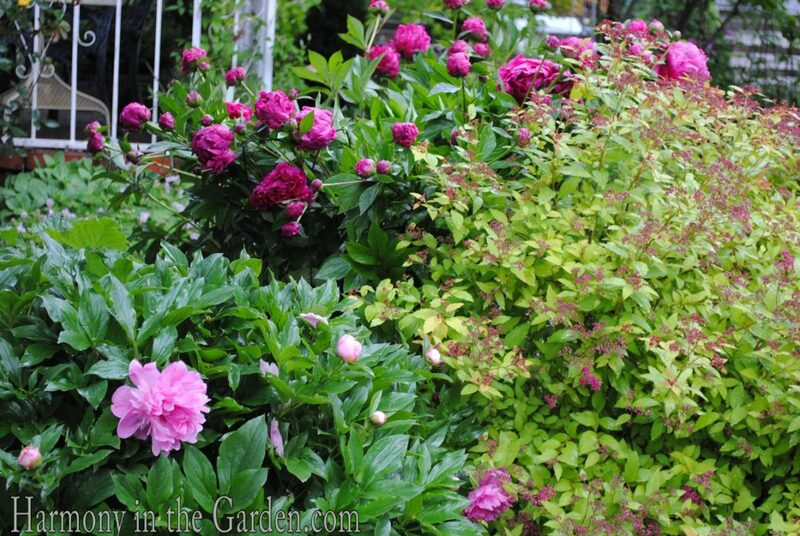 In fact, I’m beginning to think foliage is her specialty and have decided to write about how she uses it in her garden to help extend year-round interest once those blooms have long faded away. In my latest book, Refresh Your Garden Design, I write about the importance of using the various aspects of foliage to create interest in the garden that lasts well beyond spring and summer’s show of flowers. Now that I look at my mother’s garden, it seems clear where I found my inspiration! Texture is just one way to take advantage of foliage’s different properties. 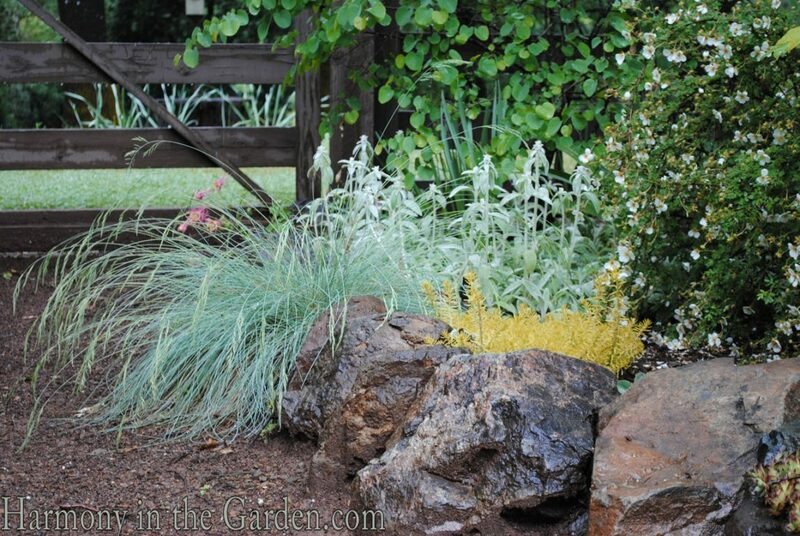 In this case, elevating a common Pink Muhly grass to a focal point status in the garden. It had rained the day before ,and the beads of water still clung to the tips of the grass causing it to shimmer in the morning light. I especially like the way the blue fescue grass softly cascades over her stone walls, lightly brushing your ankles as you walk past. 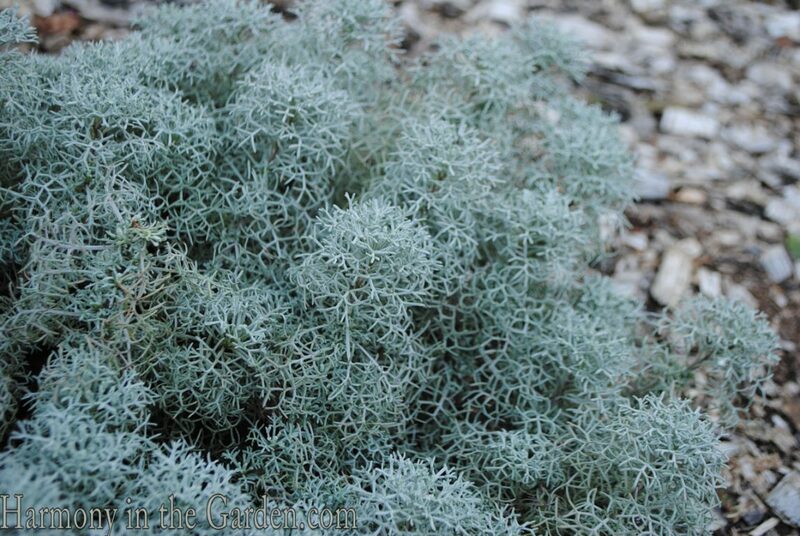 Or the crinkly soft puffs of the artemesia canescans which quietly begs you to reach down and touch its soft sponge-like foliage. More blue fescue grass softening the sleek flagstones at the base of the concrete bench (also made to look like highly textured tree bark.) If you closely look at the photos, you’ll see texture everywhere with very few flowers in sight! I always answer with an enthusiastic ‘Yes! That’s the whole point, isn’t it?’ To have a garden that has these momentary spots of beauty? That’s what makes a garden exciting and fresh, always offering something new to inspire. Here you can see how the cranberry-red berries of of my mother’s ‘Adam’ Crabapple tree perfectly frame her fountain while pulling out the colors of the surrounding frost-kissed Nandina’s foliage as well it’s own small, red berries. Also note how the remaining crabapple leaves, which have turned a beautiful shade of gold, echo the foliage of the neighboring ‘Goldflame’ spirea shrub. In this fall combination, I love how the glowing red and burgundy foliage of the ‘Concorde’ berberis in the foreground highlights the red berries of the Cotoneaster parneyi in the distance. Again, notice the textural use of the grass helping to add another element of interest. My mother excels at creating garden magic starting with the lowest layers of the garden. Her passion is rocks, stones, and boulders. I’ve spent my lifetime watching her gather beautiful rocks that have washed down the mountains in winter storms, lying there on the side of the road just waiting for someone to rescue them from a lonely life in a ditch. I’ve watched her spend hours in the garden working, and re-working a stone wall until it looks ‘just right’ in her mind. For those of you who have visited my own garden, the stone walls you see have mostly been created by my mother. And it doesn’t stop there. 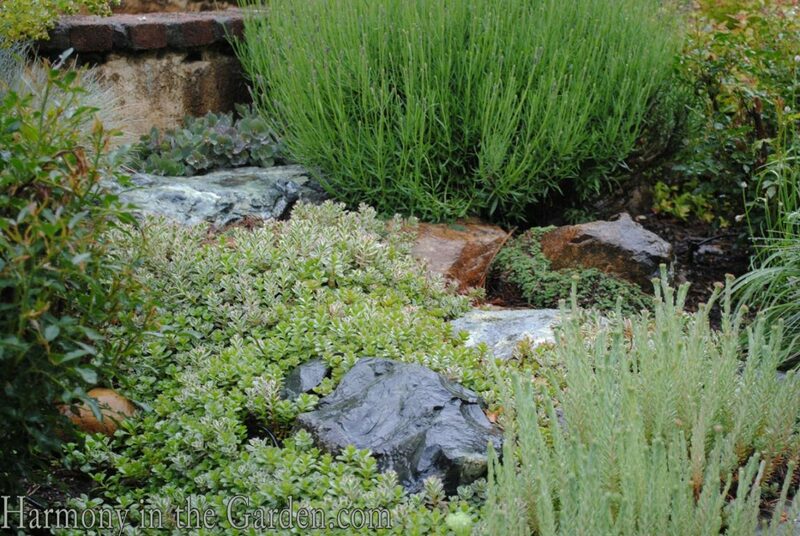 Once she has a perfectly shaped stone securely nestled in its spot, she then makes sure to accentuate its colors by carefully choosing a particular groundcover to surround the stone. 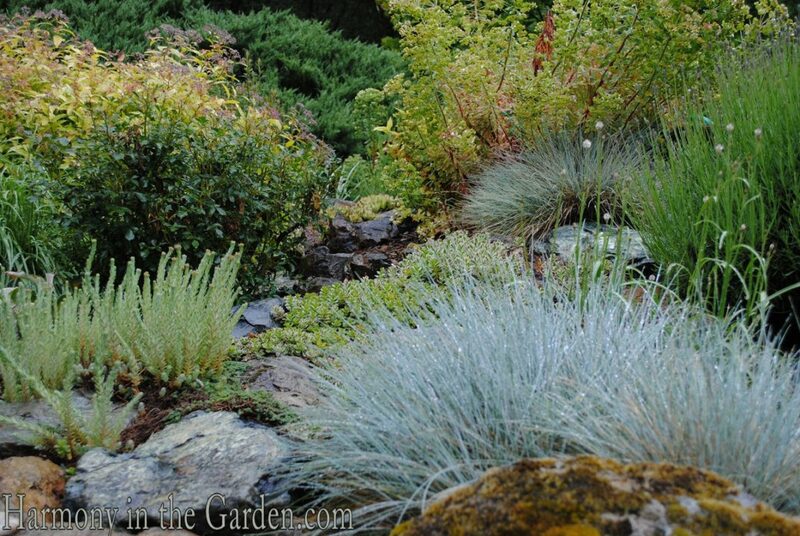 She also never wants the stones to sit there stark and lonely looking, instead preferring to use groundcover to also help soften their edges. It’s the little details like this that make a garden sing with delight, causing the visitor to slow down in an effort to take in all the subtle details. So now, onto another holiday giveaway – for FIVE winners, no less! How’s that for generous! Update: Contest is Closed. Congratulations to Kris P., Patricia K., Jean V., Laura and Barbara – you won! I’ve already sent you an email so if you can kindly send me your home addresses I’ll pass them along to Gardeners Supply. Enjoy the gifts! Founded in 1983, Gardener’s Supply is proud to be a 100% employee-owned company of avid gardeners providing garden-tested, earth-friendly products combined with practical information. Headquartered in Burlington’s Intervale, Vermont, the company has won many awards for its patented products and innovative management style, and donates 8% of its profits to gardening and other community projects. 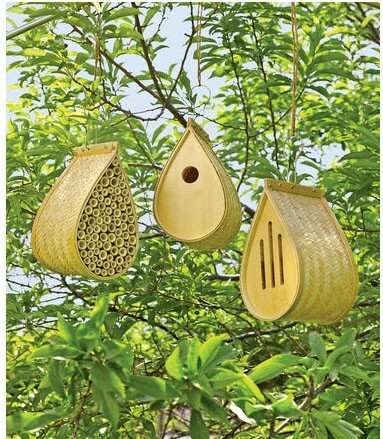 The fabulous prize they’re offering is a collection of three (very well-made, I might add) Bamboo Habitat Homes to welcome birds, bees and butterflies to your garden. Woven from natural bamboo, these teardrop-shaped shelters shed water while providing good ventilation. The birdhouse has a 1-1/4″ entrance hole for common backyard birds like nuthatches, titmice, and finches, and there’s a clean-out door on the back. The butterfly shelter provides a safe spot for butterflies to roost, with narrow slots that keep predators out. The door on the back provides access so you can place bark or twigs inside for butterflies to perch on as they roost or take shelter from rain and wind. The mason bee house provides a happy home for these peaceful, non-stinging bees that can boost your garden’s productivity by pollinating flowers. Each mason bee visits as many as 1000 blooms per day — 20 times as many as a honeybee! How to enter: Gardeners Supply is generously offering this collection to FIVE winners so to win, make sure to leave a comment here on my blog letting me know your favorite way to add a little fall magic to your own garden. The winners will be randomly chosen by midnight Dec. 17th and contacted within 24 hours. If the proposed winner forfeits or does not claim the prize by Dec. 20th, the prizes will be re-awarded based on the sponsor’s sole discretion. All prizes will be awarded. Please provide your first and last name as well as your email to enter this contest, so I can immediately contact you if you win. The winner agrees to allow his/her first name to be mentioned in conjunction with this giveaway. A few more details: This giveaway is limited to U.S. residents only, who are over the age of 18 years old. NO PURCHASE NECESSARY TO WIN. This sweepstakes is VOID WHERE PROHIBITED BY LAW (wherever that is, I’d sure hate to live there!) By entering this giveaway, you agree to these conditions. By law, I need to disclose that I was sent a sent a set of these three habitats to trial in my own garden and believe me, they’re fantastic. I just love them and hope you do, too! Best of luck, everyone! And if you don’t win this prize stay tuned as I’ll be offering two more giveaways through the end of the month. Oh, how I love the holidays! 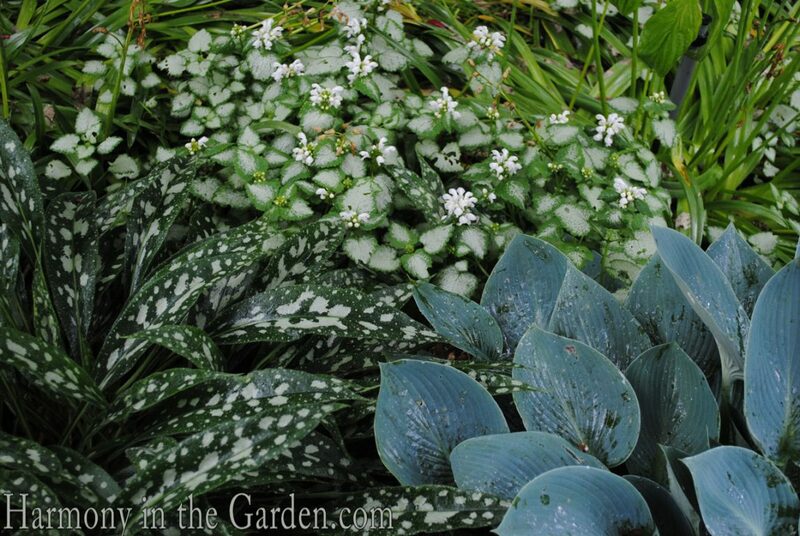 ← Planting bulbs in a warm climate plus a HUGE Cyber Book Party! 71 Responses to Lessons from my mother’s fall garden & another holiday giveaway! Rebecca…would love to win a birdhouse, especially since Meadow Vista is a bird sanctuary. But you probably already know that. We need to talk. I live in Meadow Vista too but have never heard of a volcano top here. Tell me more. I live in the North east seacoast and have a small garden but i always look forward to my Oriental grasses showing off their reddish plumes in the fall. and my hydrangeas are so colorful. how wonderful that you and your mom share a love of gardening. Here in CT when many of my perennials have gone dormant, I still have shrubs, trees and hardy succulents to create winter interest. I also have a number of garden art that doesn’t have to compete with too many plants in late fall and winter. Absolutely stunning. …I had no idea your mother is such an amazing gardner. What a special bond you share. 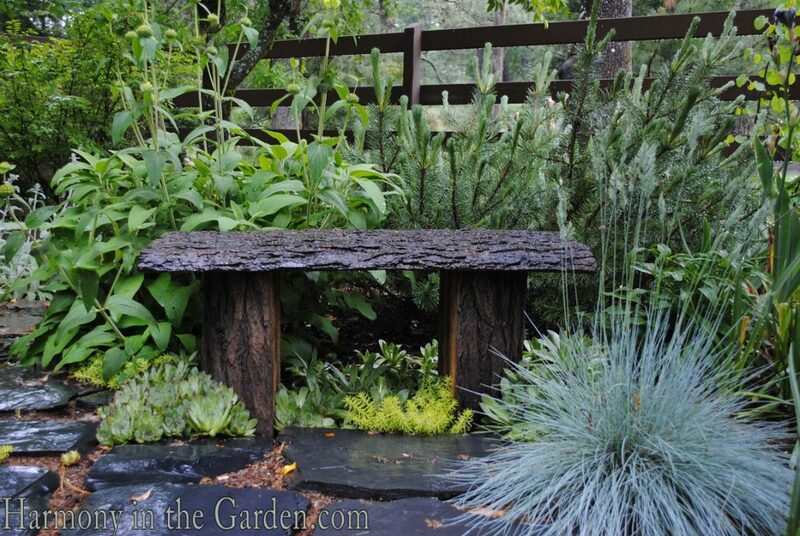 I love adding miniature “fairy” elements around the garden. Something sweet and unexpected makes me smile. Merry Christmas! I always enjoy seeing your Mother’s Garden. What a wonderful gardening legacy she has passed to you. Wishing you good health and a WONDER FULL Christmas. Fall in my garden is accentuated by the red berries on over 20 native Arkansas dogwoods. As the leaves fall they stand out in the landscape. I learned from you that fall is a great time of year to really look at the structure and texture of my garden to give myself a reason to be in the garden each day. Boy has it worked. My fall/winter garden has never looked so full. I installed low-voltage lighting on a timer so that each evening my garden still delights and does not feel like a black hole. Gotta love a warm cup of tea and an evening garden stroll. Your mother’s garden is indeed beautiful and I agree with you that those moments of serendipity (or clever design) when plants create echos in terms of color or shape are what creates magic in a garden. Fall is our primary planting season in coastal Southern California and I’m always looking for color echos and complements in choosing new plants for the garden. This year, we tore out a wide expanse of lawn in the front yard so I’m in a plant shopping/installation frenzy at the moment. As we don’t have much in the way of fall foliage color changes, I find myself drawn to warm colors that mimic the bright leaf color found in fall gardens in colder climates. Autumn is one of my favorite times in the garden — when the stark bones of the trees and the ever-changing colors make the year’s most sophisticated palette. It is then, too, that, that the structure of the garden becomes accentuated. It is when I make subtle adjustments for the coming year. A stone here, a statue there, an arch moved a few feet this way or that. It all comes into focus in fall . . .
Love your writing, love your site! Superb photography! 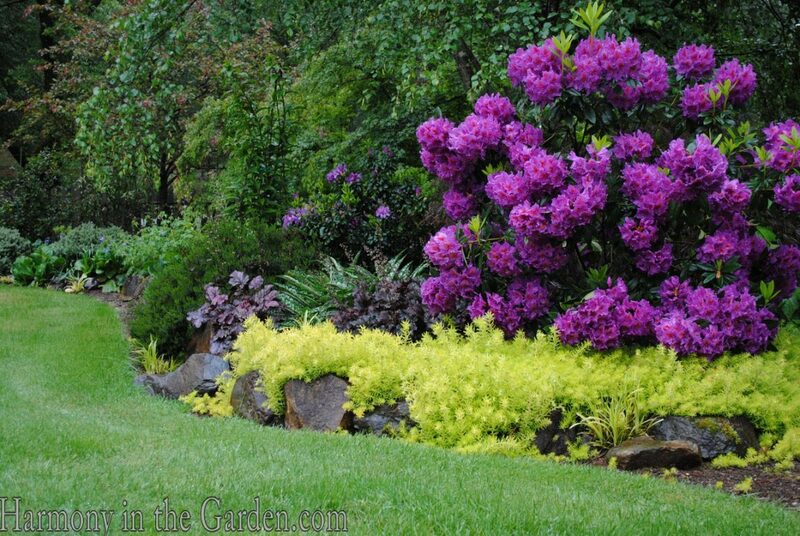 What is the chartreuse succulent under your dark purple Rhododendron? Very inspiring! My mother was also a great gardener and could “see” the combinations before they were there! I still picture her gardens when I am working in my own. I add Fall Magic by allowing two Oakleaf Hydrangeas to grow tall at each outer post of my patio cover. The top leaves turn red in the sun and cold, which draws comments from my guests. Keeping my fingers crossed that I win your new book. 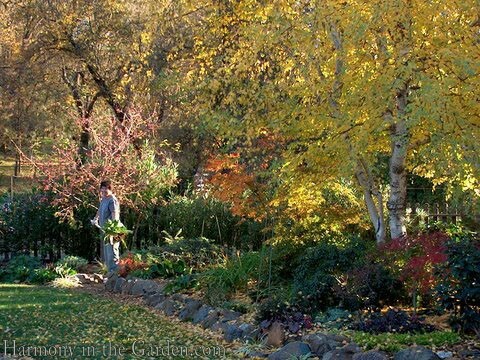 My favorite way to add fall magic to the garden is to start a new winter project. Just in the last couple of years I figured out that there are plenty of ” warm enough” days to work on a new project. It is nice and cool, no insects and nothing else in the garden pressing. ( zone 6 in case you are wondering) This year I am adding a frog pond to the garden. I dug it out before the ground froze. Now I am arranging dirt and rocks around the pond and designing layers inside the pond. I am making sure there are places for plants and hiding places for the frogs. Last year I made paths through a garden area that was hard to manage because it was too big. Fall magic for me is enjoying the Japanese Maples that are strategically placed in my garden. Some are planted in the ground but others are in pots placed so that they can be viewed from inside also. I loved this article! I am a rose enthusiast and invest most of my garden space in the cultivation of my favorite rose varieties, but using various perennials, both flowering and foliage only, and whimsical accessories tastefully placed, brings my whole garden to life! Thanks for the inspiration ideas. beautiful pairings in your mothers garden. I love how you point out the details. Love those houses! This article about your mother’s garden was inspirational to me. I sometimes grumble and groan as I attempt to plant in my rocky New England soil with the pick axe being my most important tool. Your mother’s clime and soil and the beautiful garden she has created despite the conditions give perspective. This fall I planted some colorful cabbages and kale in my my gardens and window boxes, and they’re still looking beautiful even in the snow! Time now to get some greenery and berries in those window boxes! Beautiful garden. Here in the Missouri Ozarks with lots of rock and thin soil, I can relate to her gardening conditions “extraordinary determination with no fear of hard labor and a strong back”! Such a wonderful garden your mother has. I myself am a huge fan of all the wonderful grass available. She uses them perfectly in her garden. Fluffy and light Pampas grass has always been one of my favorites. Merry Christmas! Like you, my love of gardening was passed on to me by my Mother! When I was 5, my Mother took me to the local garden club show. Apparently, I entered the children’s category and won my first blue ribbon! I was born in the Midwest but have lived in California for many years. Something I do miss are the 4 distinct seasons. To remind me of Fall, I planted a variety of Liquidambar here in my California parkway that turns beautiful shades of gold, burgandy and orange. What a Beautiful article ! You and your Mother are inspirations! I like seeing autumn joy in the fall Gardeners. I add fall magic to my garden by replacing my summer flower arrangements in my planters with fall floral designs. I use mums, wheat sprigs, and berries to add a touch of warmth. I also arrange gourds and pumpkins around the planters to really bring the autumn colors out. Wonderful post, Rebecca. Seems you and your mom have a lot in common — strength, determination, and an eye for beauty and a way of helping nature create it. Fall magic happens in my garden when crape myrtle leaves fall on similarly colored flagstones, also when monarch butterflies hang from arbutus leaves, matching the tree’s nearly ripe, pendant fruit. Thanks for sharing photos of your mother’s beautiful gardens. It must be such fun to share time together in the garden. I’ve added a bit of magic to my fall garden by adding more fall-blooming native plants, including milkweed, to lure monarchs to stop over on their way south to Mexico for the winter. There seems to have been a bit of a rebound in numbers here in NE Wisconsin this year. Can’t wait to see more of your mother’s garden and to read your commentary. 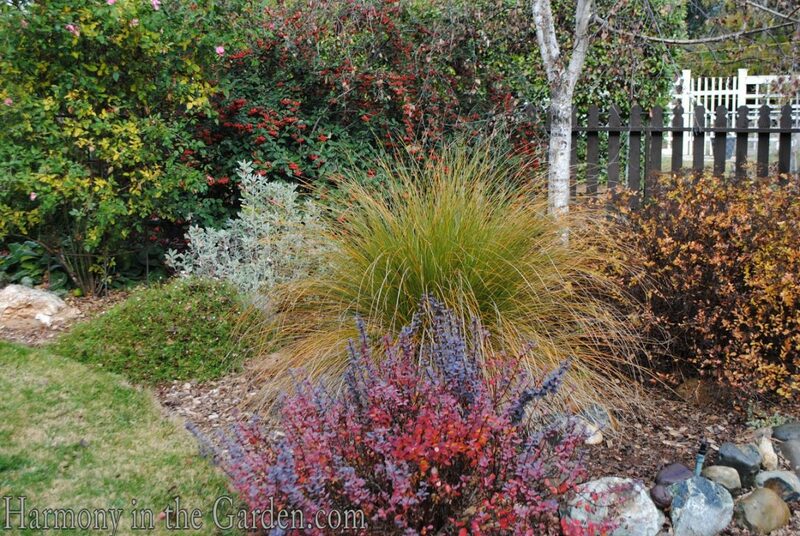 Brilliant leaf colors and ornamental grasses are what I love about the fall garden. Hope you’re feeling well Rebecca. I love your mom’s garden, thanks for sharing. 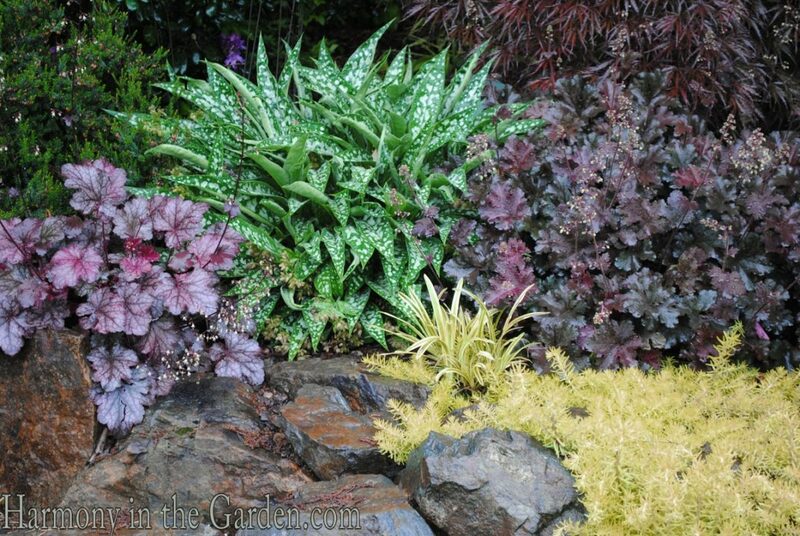 I particularly love the Pulmunaria, hosta, and nettle combination, genius! I have a new client and he is wants to rejuvenate his garden. I am going to be busy studying books, especially yours, to figure out which plants I want to add to his garden. I hope you are well, you are in my thoughts! I have planted Sedum Angelina in many parts of my garden as I love the beautiful chartreuse colour during the summer, but especially love the way the foliage turns a fabulous red/orange as the weather cools. 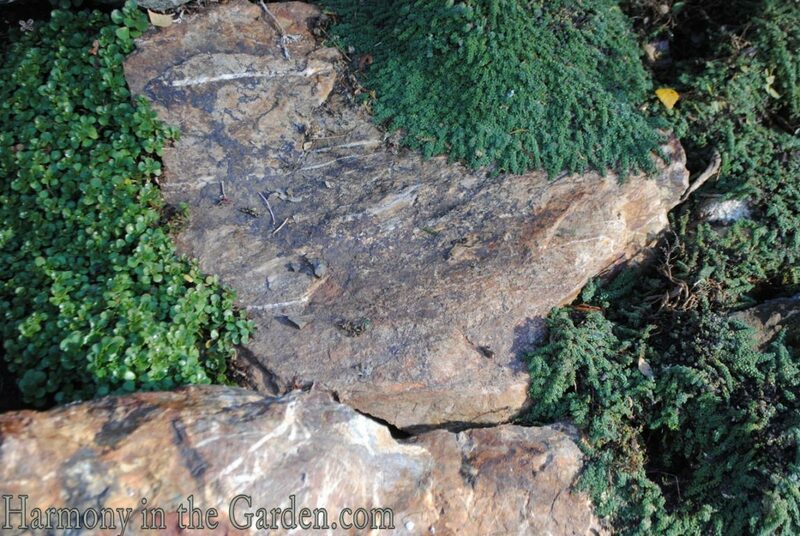 It works in my pots; in a partially shaded area; on my dry hillside and in a more regularly watered garden. I can’t stop adding this wonderful plant to my garden. I love how your mum has added it to her shady areas with Pulmonaria and Heuchera. I love the idea of passing the love of gardening through the generations. I learned from my grandmother and passed this to my daughter and now grandchildren. Fall comes late to Pasadena where I live. I always love the switch from summer edibles to winter as soon as the weather cools. Living in the snow belt of central NY I have some challenges for later fall as flowers and foliage fades once we have a killing frost….but later blooming native plants and wonderful bushes/plants that sport stunning fall foliage are my tricks. I also try to leave seedheads as they look great with browning grasses when the early snow flies. I loved reading about your mother’s garden – it’s beautiful! My mother also loved gardening and was very modest about her abilities. She passed away last spring and I find that being in the garden makes me feel closer to her. It’s a real blessing to have that connection. As far as fall magic goes – I took a class at my local gardening center on how to make a mini conifer garden, and it really looks beautiful with a bit of snow that’s on it now! I’d love to twin this set! My favorite fall plants are sweet sutumn sedum & I love my Japanese maple trees. I have both of these all around my garden & love them the most in the fall. Fall magic in my garden comes from the blooms that open after the hot days of summer. We have a wonderful native aster another wonderful plants to add bright color instead of turning leaves which are few in my area. I’ve just been introduced to you by way of Sharon Lovejoy, and would be delighted to win one of your generous giveaways. Having lived in southern Alabama for only two years, I’m enjoying the ‘tropical’ aspects of our yard and would like to add more ferns and grasses. Thank you for sharing your mother’s fall garden; I look forward to future posts of the changing seasons. I can see where you got your good eye for design from! 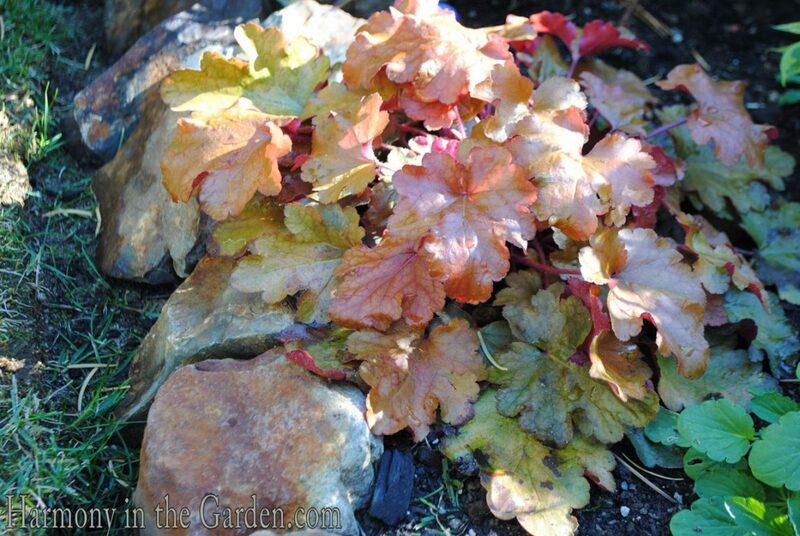 In my yard in the fall, I love the changing colors of the grape leaves. I wish I had an idea for adding some fall magic to my garden. Right now the rain is coming down, thank goodness (Salinas, CA) and my California currants are blooming and my California fuchsia is leafing out again. Maybe those are my fall magic! I would love those bamboo critter houses, by the way. And thanks for posting about your mother’s garden. What an inspiration! Thank you for this delightful tour of your Mom’s garden and for taking the energy to share it all with us. My fall color comes from maples, oak leaf hydrangeas and nandina berries. My great-grandmother “Granny” instilled my love of nature and gardening. She had a sunny flower bed just outside her front door that was a riot of color and activity…bees, butterflies, hummingbirds. She taught me how not to fear the bees and how to carefully approach a butterfly to observe its many colors. Most of what she planted was self-seeding, so, as I grew, so did the borders of her garden. I draw much happiness today from my own garden and from the precious memories of her. Best way to add fall magic is LEUCADENDRONS! The foliage has amazing color not only in the fall, but all year! I would love to see more of your mothers garden. She is a very talented gardener! Your mom’s garden is incredible. We had a big swath of cheerful California Giant zinnias that bloomed their heads off all through the fall, so pretty! Since they are cut and come again, we’ve had vases full of them in the house, too. I agree with you that the little details make a garden, mother’s garden is gorgeous and filled with great mixtures of color and texture. Thanks for the giveaway! The mason bee house will be a little more refined then the 8″ pieces of sunflower stalks that I tie together with raffia and tuck into our lattice fence. It’s the love of nature and growing things turned into an art form. It’s always been difficult to see how anyone can improve upon nature, but it looks like you and your mother have a gift, an eye for beauty combined with that love of nature. I’ve always enjoyed the rows in the field, the first sprouts, first blossoms, first fruit, but that all ended with the harvest, a sad time for me. Your creations last all year! Thanks for sharing! i am still learning how to create year round interest in my garden. Fall gives me a chance to evaluate the structure and plan for next year. I try to keep my paths clean and rake the leaves (I have lots) into the beds to protect plants for the winter. Your Mother’s garden is lovely. I love the textures and the way the entire garden envelops the viewer. Say hi to your dear Mom for me! Fall magic is happening in December now, or so it seems. Tree colors are turning their gorgeous colors of yellows, oranges and reds. Winds pick up with a little rain for the hardy annuals to do their thing underground, keeping me in suspense until next spring. Can hardly wait. And ohhhhh the birds. At sunset we sit in the patio just listening and watching them scurry for a place to roost for the night, what a delight. What an inspiration your mother’s garden is!! As a Northern California dweller and container gardener, I have moved various succulents and cacti to center stage, balanced with the foliage of what’s left. As for these bamboo houses, they are wonderful! In the bay area our fall is like a second spring also. But I like to keep the season magic by keeping ornamental gourds around and making wreaths from eucalyptus branches which I have to rake up any way. Can you show us how to do that? When I visit Ca, my fingers just itch to pick up those things and weave something! I rely on my liquid ambers, nandina and Chinese tallow tree to give our garden some fall magic here in southern california. 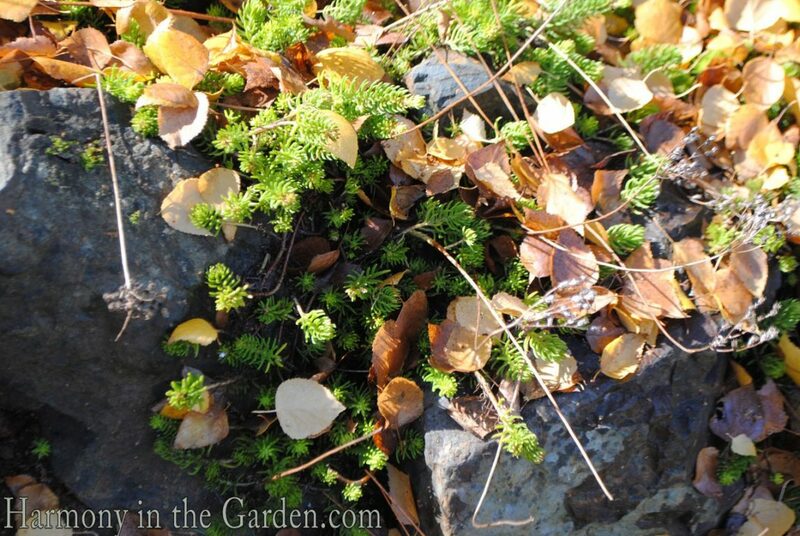 Your mother’s garden is absolutely extraordinary — how does she do that on top of a lava bed??? I am in the process of removing my sod lawn to plant CA natives. It will take some time for the plants to grow and some experimenting to see what to add for fall color. My beautiful liquid amber adds lots of beautiful fall color, and tons of leaves to rake, but I’m excited about designing and choosing my natives for my front yard. i think a cornstalk archway is a nice fall idea,great blog. To live in a garden like your Moms must be paradise. The apple doesn’t fall far from the tree…as they say…so your gardening talent comes very naturally. What a lovely garden your mom has created. I have a “thing” for rocks as well and know how much work..and beauty they create. I still am working on fall color in my garden. It seems that everything kind of fades on me before it should. I’ll just keep working at it! What lovely gardens and lovely story of your mothers gardening. I admire her determination, I have enough trouble with the caliche under a quarter acre. 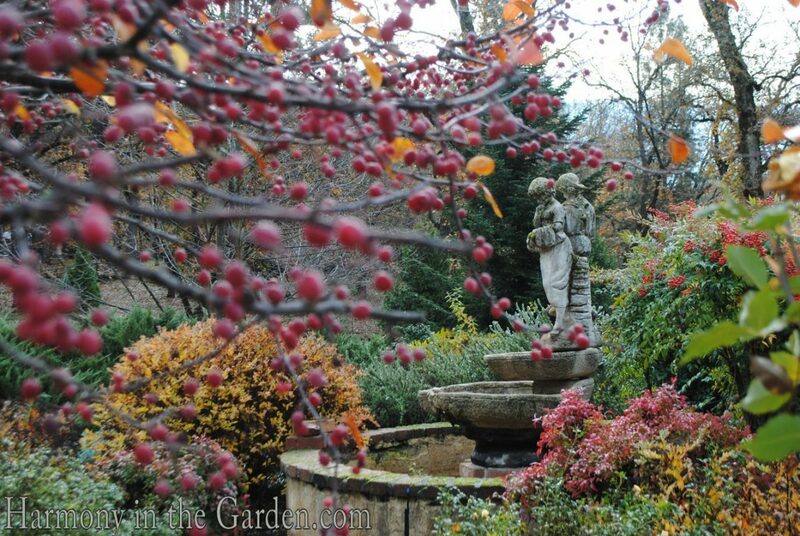 My fall garden retains interest with American beauty berries and ornamental grasses. I keep waiting for the Roughleaf dogwood leaves to turn red like they’re supposed to. Take care of yourself Rebecca. Fall in my garden includes the Japanese maples and the crepe myrtle turning scarlet along with the coral barked maple. So gorgeous! These little houses would be awesome in my garden! Thanks for the giveaway! I am gonna decorate my lawn flamingos for the holidays! And your mom has a fantastic eye for foliage combinations. There’s so much contrast! I love it. Fall magic happens in my garden in Ohio when the Japanese Maples are in their full glory. Their leaves are among the last to change color and just glow on a sunny day. They are just beautiful against the green lawn and evergreens. Your mother has an artist’s eye, Rebecca, as well as a strong back, determination, and a delightful daughter. I am blown away that she matches plants to the friggin’ rocks! Genius. Thank you for sharing her garden with us. I look forward to your seasonal updates. 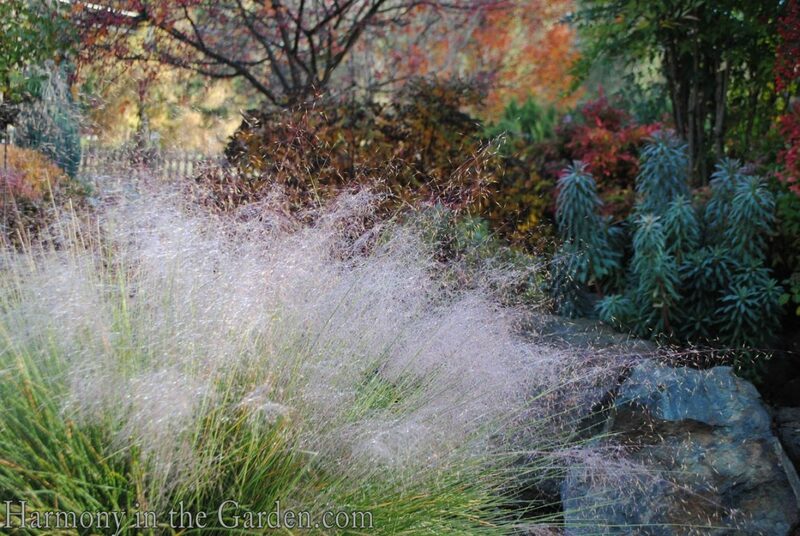 As for adding magic to my fall garden, I use lots of ornamental grasses and fall-blooming perennials. Autumn is our second spring in Texas! There isn’t much to add to the garden. With fall comes all the beautiful colors of the leaves changing! Wow, what a beautiful garden. If only I could put together combinations llike that! I got my love of gardening from my mother as well. She was gardening with native plants long before it became popular. Here in Texas I rely alot on bright pots and hardscape for color during the fall and winter, but I also make sure to include native flowers like asters and salvias for color and evergreens for structure. I decided recently that this is going to be the winter that I add a mason bee house to my garden, so I really hope I’m one of the winners. 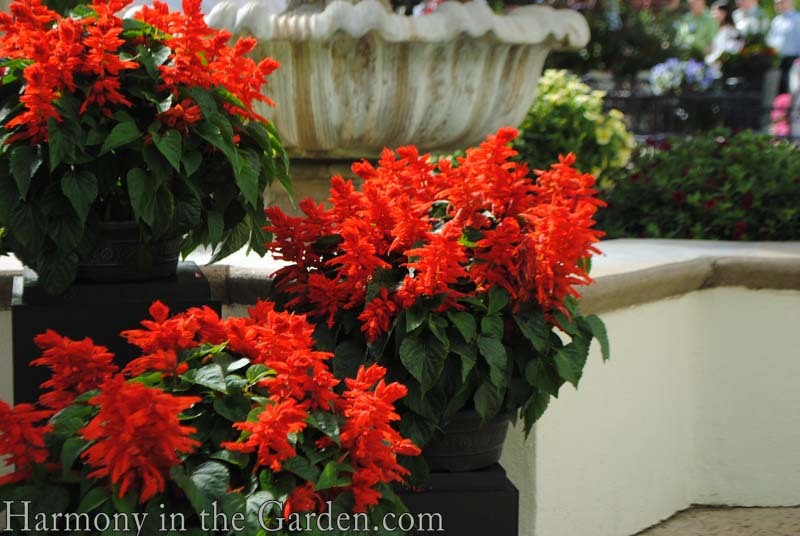 I’m not sure I really have a favorite way to add fall magic to my garden, but I do try to make sure I still have something either blooming or providing a nice foliage accent at that time of the year. 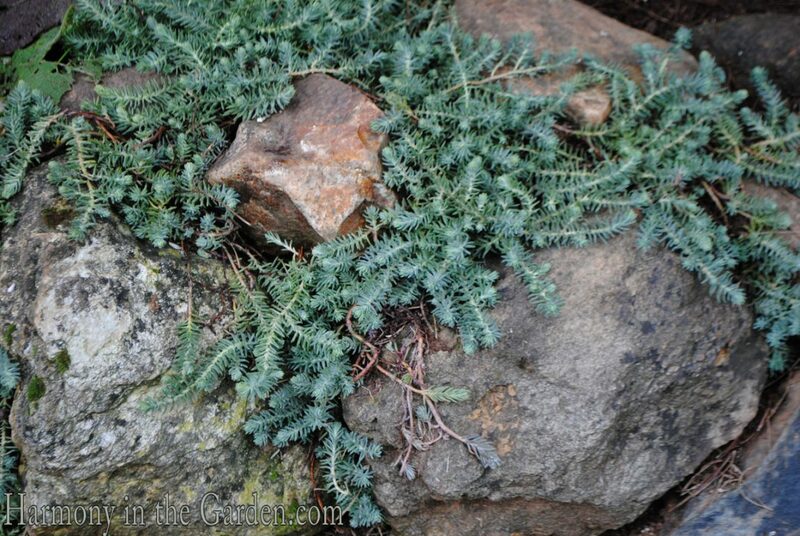 I love using ground covers to soften stones and concrete too, especially Sedum Angelina. Your mother’s garden looks to be one of the most beautiful I’ve ever seen. And, fall magic? I try to keep my paths raked:). I love that your emotional ties to gardening comes from your family. It’s not just about the beautiful plants and combinations, but the conversations and one on one time you have had with the important women in your life. You are one lucky woman!